“The Holy Spirit said, ‘Set apart for me Barnabas and Saul for the work to which I have called them…’ Barnabas and Paul have risked their lives for the sake of our Lord Jesus Christ” (13:2; 15:26). As people of the Way we are called to risk-taking: “The Holy Spirit said, ‘Set apart for me Barnabas and Saul for the work to which I have called them…’ Barnabas and Paul have risked their lives for the sake of our Lord Jesus Christ” (13:2; 15:26). Commissioning missionaries to bring the gospel to Gentiles was a radically new idea, and a risky one. They risked ridicule and rejection by both Jews and Gentiles. They risked their lives. Yet the risk paid off: the fact that we, Gentiles in a foreign land, are followers of Jesus is testimony to this. The early Christians were following in the risk-taking way of Jesus, who taught and lived the way of the cross—self-giving love for others—even though that meant ridicule, rejection, and death. There are many examples through Christian history, and specifically Mennonite history, of people taking tremendous risks for the sake of the kingdom of God and the gospel of Jesus Christ. Like Jesus himself, like those first followers of Jesus, and like faithful Christians through history, we are called to be willing to take radical risks in following Jesus today. What risks have I taken in my life? How have those risks failed? How have those risks paid off? For better or worse, how have those risks shaped my life and faith? What risks have we taken as a church? 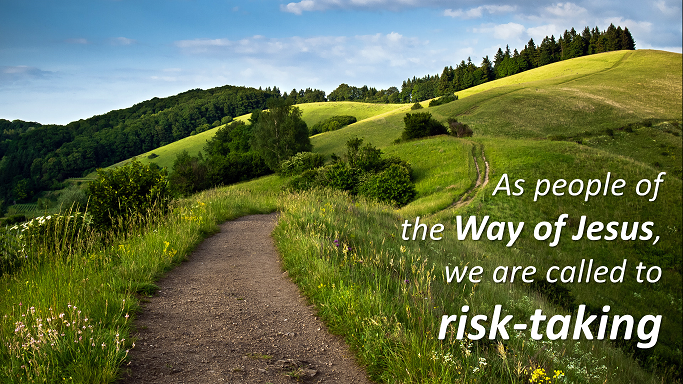 How have those risks shaped our life and faith together? What risks might Jesus be calling me to take in my own life? What risks might Jesus be calling us to take as a church? Are we willing to risk our reputation or our safety in order to faithfully follow Jesus? Based on a sermon delivered at Morden Mennonite Church on October 25, 2015. This entry was posted in Michael Pahl and tagged acts, church, cross, jesus, people of the way, risk, taking risks. Bookmark the permalink.